Pieter Winne is the 9th great-grandfather of Richard, James, Gary, Lisa, Carl, Jane, Bruce, Cathy, Ron, Stacey, Matt and Sandy; and 10th great-grandfather of Asher, Owen, Caitlyn, Becky, Emily, Jack, Jill, Jordan, Mike and Brian. Pieter Winne was born the son of Franciscus Winne (1585-c1672) and Jannetjie (surname unknown) in Ghent, Flanders (now in Belgium), and baptized there in St. Bavo’s Cathedral on April 14, 1609. Pieter moved to Amsterdam, married Aechie Jans Van Schaick, date unknown, and together they emigrated to the Dutch colony of Curaçao in the West Indies, where their son, Pieter, was born in 1643. Aechie died in Curaçao in 1647. Pieter Sr. subsequently left the West Indies, arriving at Fort Orange, New Netherlands, in 1652, and becoming a tenant farmer and operator of a sawmill at Rensselaerwyck, near present-day Bethlehem, New York. 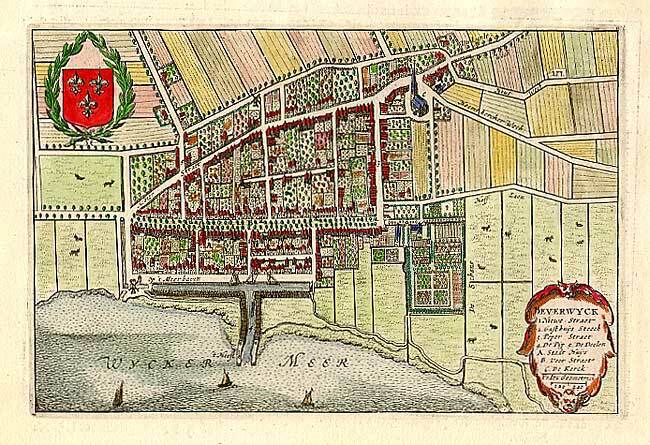 By 1655 Pieter had built a house in Beverwijck (renamed Albany by the British in 1664), become a fur trader, and married Tannetje Adams, a settler from Friesland. Pieter and Tannetje would have 12 children: Adam (our ancestor; 1658), Livinius, Frans, Allette, Killiaen, Tomas (another ancestor, c1664), Lyntje, Martin, Jacobus, Eva, Daniel, and Rachel (by virtue of her marriage to Jellis Fonda the 5th great-grandmother of legendary actor Henry Fonda). In addition to prospering in the fur trade, Pieter purchased a sawmill in Bethlehem 1673 and another in 1677. In July 1675, he bought one half of Constapel’s Island in the Hudson River below Albany for the price of 69 beaver skins. From 1672 to 1684 Pieter served as a magistrate for Bethlehem. He was also active in the Albany Dutch church, serving in a number of capacities. Pieter Winne died in his early 80s, sometime between May 1690 and May 1693. On May 7, 1693, Pieter’s widow Tannetje married Martin Cornelisse Van Buren, great-great grandfather of President Martin Van Buren. Tannetje died before 1697. Pieter Winne has the distinction of being our double ancestor: Pieter’s granddaughter, Lidia Winne, daughter of his son Adam, married Jacobus Moll (Mull) c1703, while his great-granddaughter, Rebecca Barheit, descendant of Adam’s brother, Thomas, married Jacobus Moll’s son, Johannes, Rebecca’s second cousin, c1745.